June 2011 is a month where one catholic holiday comes after the next. For Austria this means, plenty of days off work and off school. For visitors to Austria this means, keep in minding that shops will be closed due to holidays. So much free time will be used by many to take care of the plants and flowers in the garden and on the balcony and it is the time to pick berries: expecially strawberries, but as well red currant, and raspberries - usually black currant, black berries, blue berries and brambles take a little longer to ripen. June calendar sheet - heart by heart, to clebrate Father's Day, hearty and cudly cosy. 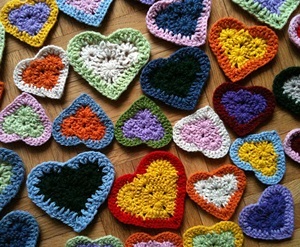 The hearts are easily made with the pattern Maria and step by step instructions, as well for less experienced crocheters or thos who love knitting and want to give something new a try. Depending on weather and vegetation it is the time for the elderflower tree to blossom – this is the time to hurry up and fetch some of these lovely smelling bushes of tiny little white flowers. You can use elderflower blossoms to make a yummy desert. Cover them in batter and fry them. Very popular in Austria is elderflower cordial – at MiaDeRoca we offer you our very own recipe we have use for ages to produce this yummy elderflower syrup made of elderflower blossom. Give the elderflower cordial recipe a try, the effort is definitely worth it. You can use this syrup for yummy aperitif serving it with Champagne or Prosecco, our make some delicious and refreshing summer punch. On a garden party, or doing some BBQ with friends we always have some elderflower cordial at hand. The good thing about self-made is, that you treasure it as being something special and you always know which ingredients it has, and what is not included. Our June calendar photo is dedicated to Father's Day – in Germany Father's Day is celebrated on the holiday of Ascension, which is on June second this year. In Austria Father's Day is like Mother's Day on a flexible date, on the second Sunday of June, which is June 12th.